Three really is the magic number when it comes to ice cream and when it's finished with a prettily tinted meringue who can resist? Equipment and preparation: for this recipe you will need a 3 litre/5¼pint pudding bowl, a sugar thermometer, a piping bag fitted with a 2D star nozzle and a freestanding mixer with a whisk attachment. Line a 3 litre/5¼pint pudding bowl with cling film. In a large bowl or a freestanding mixer, beat the vanilla ice cream to soften a little then spoon into the base of the pudding bowl. Level with a spatula and freeze for one hour, or until firm. Wipe out the mixing bowl and add the strawberry ice cream. Beat to soften a little then spoon over the vanilla ice cream. Level with a spatula and freeze for one hour, or until firm. Preheat the oven to 190C(170C fan)/375F/Gas 5. Lightly grease a 20cm/8in sandwich tin and line the base with baking parchment. For the sponge base, place the eggs and sugar into a large bowl and beat at full speed with an electric whisk until the mixture is pale in colour and thick enough to just leave a trail when the whisk is lifted. Sift the flour and cocoa powder over the surface of the mixture and gently fold in with a metal spoon or spatula. Pour the melted butter down the side of the bowl and gently fold in. Pour into the prepared tin and tilt the tin to allow the mixture to spread evenly to the sides. Bake for about 10–12 minutes, or until springy to the touch and beginning to shrink from the sides of the tin. Turn out and leave to cool on a wire rack. For the filling, in a large bowl or mixer, beat the chocolate ice cream to soften a little then spread over the strawberry ice cream. Level with a spatula and freeze for one hour, or until firm. Preheat the oven to 240C(220C fan)/460F/Gas 8½. To make the meringue, place the sugar and six tablespoons of water in a heavy-based saucepan. Stir the sugar and water over a medium heat until the sugar dissolves, then bring to a fast boil until it reaches 110C/230F. Whisk the egg whites in a large bowl of an electric mixer until stiff peaks form when the whisk is removed. When the syrup temperature reaches 115C/240F on a sugar thermometer, slowly and carefully pour the syrup over the egg whites in a thin stream while continuing to whisk. Taking care not to let the syrup run onto the beaters as it may splash. Continue whisking for about 15 minutes, or until the meringue is completely cold. Take the cake and ice cream from the freezer and remove the cling film. 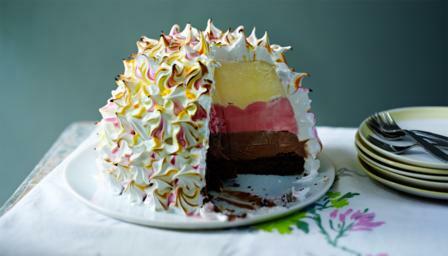 Using a palette knife, spread a thin layer of meringue all over the ice cream and sponge to form a coating. Bake in the preheated oven for about 4-5 minutes, or until golden-brown. Decorate with mixed berries and serve immediately.